This Saturday, April 16th is Record Store Day. Just hearing those words gives me a thrill. It’s no mistake that my Shredded Orphans series books are about a band. I love music! I try and do my part by buying CDs when I can and have even been known to buy vinyl. Yes, I’m old school and I have a turntable or as I like to call it, record player. Be sure to check out the website for Record Store Day, where you can download a list of special releases and find a participating record store near you. There are a ton of records I would love to get, so you might consider making a list before you head out to the store. I’m thinking David Bowie, Monkees picture disc and Tom Petty are at the top of that list. Who’s on your list? Support your local record store this Saturday and Happy Shopping! Two years ago, I did a marathon blog of posting one poem a day for the entire month. It was a blast, but a little nuts. 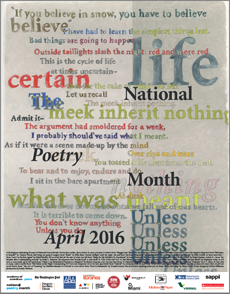 Check out the archives for April 2014 starting with the one linked here to read the great poems that I posted with the help of a lot of fellow poets and writers. Enjoy this month of poems and I’ll leave you with one from the new Shredded Orphans book out soon, The Shredded Orphans and the Space Pirates. My blood is in the soil. Forever this mine is mine.